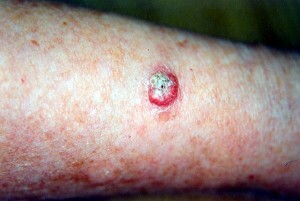 Keratoacanthoma (KA) is a skin condition that gives rise to discomforting sores on the body and may also cause cancer. Read on to know what is Keratoacanthoma and also learn about its causes, symptoms, diagnosis and treatment. It a low grade epidermal growth that arises from the hair follicle and has a quick progression. It is also referred to as Pseudocarcinoma. The condition is also referred to as “Molluscum Sebaceum”. The ICD9 Code for Keratoacanthoma is 238.2. This skin disease is said to affect one out of every 1,000 individuals. The condition primarily arises in people who are older than 60 years of age. It afflicts males twice as much as females. It is uncommon in young adults, darker-skinned patients and Japanese people. It is a Keratoacanthoma variant which is characterized by lesions that sometimes grow several centimeters in size. It is marked by the development of multiple tumors in a localized region. It is characterized by the growth of lesions that can sometimes be as many as hundred or more in number. It causes occurrence of hundreds and thousands of small follicular keratotic papules on the skin over the entire body. 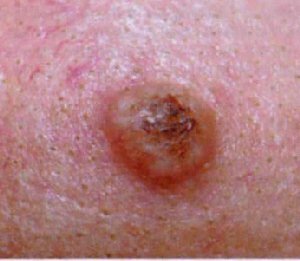 Also known as Solitary Keratoacanthoma, these are benign but locally aggressive lesions that grow rapidly. These sometimes arise in the nail structure. The condition manifests as a single or multiple hard, round growths over the skin surface. The growths appear fleshy and consist of a low central portion. The nodules usually have a smooth shiny surface. These initially look like reddish or skin-colored papules but rapidly develop into dome-like nodules at a later stage. The lesions may also change into fluid-filled blisters with an ulcer or a horn-like keratin plug developing at their centre. The papules usually arise over areas of the body that are exposed to sunlight, such as the face, neck, forearms and the dorsum of hands. Generally, these arise as a single growth. Occasionally, they may arise in clusters and grow up to 15 cm in size. The growths may spread throughout the body (metastasise) and become locally aggressive. 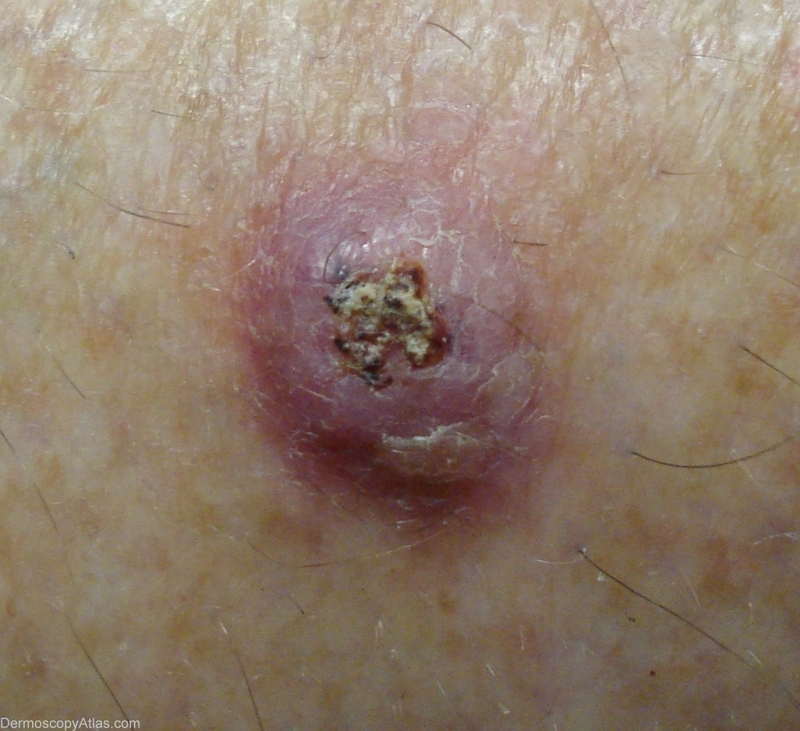 In most people, these lesions rapidly grow over a few weeks to months. This quick growth is followed by a spontaneous resolution at a gradual pace over 4-6 months. In some patients, complete recovery may take almost a year. If not excised, the growths can leave behind scars. Exposure to sunlight plays a vital role in the development of this condition. The lesions can arise as an effect of sun-exposure. Medical research indicates the ultraviolet rays of the sun as causes for the growth of KA sores. The disease may also occur due to carcinogens (chemical substances that give rise to cancer). The prevalence of both keratoacanthoma and Squamous cell carcinoma (SCC) is found to be higher in industrial workers who are exposed to tar and pitch. Genetic factors are believed to be involved in the development of some forms of multiple Keratoacanthoma that are found to affect several members of the same family. A weakened or compromised immune system can also make individuals vulnerable to this disease. These lesions also apparently arise from a single hair follicle in the neck. It usually happens in abnormal circumstances when there is multiplication of cells in the hair follicle which in turn leads to the growth of a cellular mass into a Keratoacanthoma. In some cases, a minor trauma (injury) seems to act as a trigger for these papules. This can be true even if the trauma is too small or negligible for the patient. Certain nodules of this type seem to be associated with Human Papilloma Virus (HPV) infection, which also gives rise to warts. The condition can be accurately diagnosed by pathological examination and biopsy. Shave biopsy of keratoacanthoma only helps reveal keratin fragments. For this reason, a Deep Incisional or Excisional biopsy is needed for detection of the disease. It is also necessary to distinguish it from any form of skin cancer. Systemic retinoids (such as Isotretinoin), 5-fluorouracil, steroids, bleomycin and intralesional methotrexate have been found to yield some success in treating the condition. Medical treatment is usually set aside for cases where it is not possible to carry out surgical intervention. This is particularly true for multiple lesions that are difficult to be surgically removed because of their size or location. Ointments and lotions do not help in curing this growth. However, an antimicrobial ointment may provide soothing sensations if the adjacent tissue is found to be irritated, inflamed or cracked. Topical applications of 5-fluorouracil and Imiquimod may provide effective results in such cases. 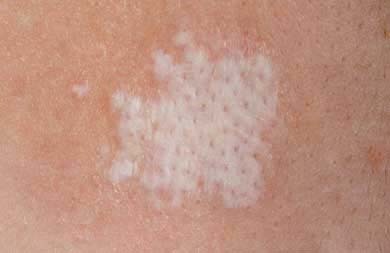 A small Keratoacanthoma is usually treated by freezing the lesion (or lesions) with liquid nitrogen with the aid of a cotton wool swab or a spray. After freezing, the treated region generally swells in size. There may be a development of blisters which may dry out to develop into scabs (crustlike surfaces). These tend to come off in about 2 weeks, though lesions on limbs can take a longer time. The technique is sometimes implemented for thicker lesions. A small amount of anesthetic is injected around the base of the papule. Following this, a sharp spoon is used to scrape out the lesion. The base of the nodule is then cauterized with equipment that resembles a soldering iron. Following this, the region usually heals quickly. The scab comes away within 2-3 weeks leaving only a slight depression or a purple/pink scar at its place. The scar gradually fades to result in a more acceptable cosmetic appearance. Lesions that arise on the lower legs or are larger in size take longer to heal, even up to 2 months. It is another common technique used for removal of a Keratoacanthoma. The process involves injecting a local anaesthetic at the base of the growth. The lesion is then cut out using an elliptical hand movement that ensures its complete removal. The exposed region is then sutured or stitched up. The stitches are taken out after a week or so and only a linear scar may be apparent at the site. Complete excision is the preferred mode of treatment for all skin neoplasms that are suspected to be Keratoacanthoma lesions. In some patients, a large growth is removed by radiotherapy, which requires several visits over a period of days. This is a painless treatment that causes lesions to form into scabs which fall off after a few weeks. These growths are radiosensitive and show a good response to low doses of radiation. The therapy may be useful in case of large tumors where resection may possible lead to cosmetic disfiguration. It is also effective for removal of lesions that recur even after attempted excision. In rare cases, Mohs microscopically controlled surgery or MMS may be needed for removal of larger Keratoacanthomas. This is especially necessary if the growths show a recurrence. Small growths have been found to be successfully removed by both Cryotherapy and Laser therapy. In case of a surgical removal, doctors may recommend usage of a broad-spectrum antimicrobial drug or an oral analgesic (such as Metacam or Torbugesic) for relief from post-operative discomforts like pain. Treatment of Keratoacanthoma is important for several reasons. Firstly, it is not always easy for doctors to make sure that a lesion is a keratoacanthoma and not some form of skin cancer. A pathological examination may reveal the presence of squamous cell carcinoma where a dermatological test shows a keratoacanthoma lesion. Secondly, the unsightly appearance of the lesion may be worrisome for a patient. Thirdly, a scar resulting from medically treated lesions are better in appearance than those which are allowed to resolve spontaneously. Keratoacanthoma growths are found to be benign and do not cause any cancerous complications. But even though these growths are non-cancerous themselves, these are often confused with lesions appearing due to an underlying squamous cell carcinoma. Squamous Cell Carcinoma is a cancerous skin condition that highly resembles Keratoacanthoma lesions. Dermatologists often mistake this condition for a benign Keratoacanthoma which can be dangerous for patients. Careful observation by an experienced physician can help differentiate a cancerous Squamous Cell Carcinoma (SCC) from a KA growth. Know about some points of difference between the two. KA lumps arise as small, hard papules on the skin surface. 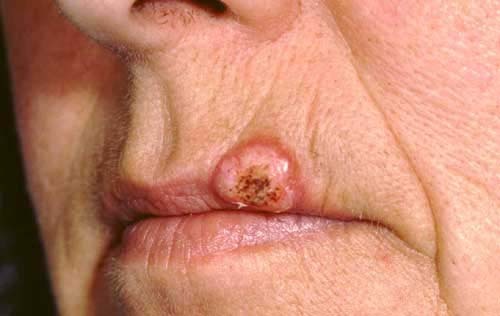 SCC lesions arise as open sores or ulcers that bleed easily. KA lesions commonly develop over the neck, face, forearms and hands. SCC growths are usually found on the lip, face, ear or an old wound. KA papules grow rapidly and have a dry core in the middle. However, SCC lumps develop slowly and fail to heal even after several months. KA lesions, even if left untreated, can go away in a few months. In rare cases, more than one papule is found to arise in patients. Such a condition is referred to as Multiple Keratoacanthoma. It is found to arise in individuals suffering from Ferguson-Smith familial keratoacanthoma, a condition that is seen to be more common in men. The disorder gives rise to large, ulcerous lesions on the skin that heal naturally. Multiple lesions of this type are also seen in patients of Grzybowski eruptive keratoacanthoma. The disease causes development of numerouspaules over the mucosal surfaces and the skin. These are extremely itchy in nature and may cause severe deformity. The disorder can be managed with the aid of oral medicines like Cyclophosphamide, Methotrexate or Acitretin. If left untreated, a true keratoacanthoma can continue to grow for several months. Once it reaches a maximum size, it generally destroys itself over some more months. It ultimately vanishes, leaving a noticeable scar in its place. Surgery helps remove or resolve these lesions with minimal or no scarring. Prognosis is usually good after excision. Rarely, the lesions may recur. In such cases, the growths can be treated in the same way. As aforesaid, patients can be at risk of recurring lesions or skin cancers. If growing sores or lumps fail to heal, medical assistance should be sought immediately. This condition does not usually give rise to any complications. It is generally marked by rapid growth of lesions over a few weeks to months. In most patients, the nodules go away in 4-6 months. In rare cases, however, it progresses to metastatic or invasive cases of carcinoma. Patients are also found to be at increased risk for suffering from subsequent nonmelanoma skin cancer. There is no known way to prevent this disease. However, taking adequate protection from sunlight can help one avoid development or aggravation of this condition. Take a look at these Keratoacanthoma images to know how the lesions caused by this skin disease look like. These Keratoacanthoma photos will help you get an idea about the physical appearance of this disorder. If you suspect yourself to be suffering from Keratoacanthoma growths, get in touch with a doctor, dermatologist or plastic surgeon. Proper diagnosis and timely treatment can help you avoid discomforting symptoms as well as potential cancerous complications from this disorder.